Children ages three and older start in the sanctuary for worship at 10 am and then go to classes after the children's sermon. Registration forms will be available in the sanctuary entryway or downstairs in the Christian Education Building. A great gift you can give to your child(ren) is a Christian and spiritual education and building of character and sense of holy purpose to life itself. You do not need to be registered in advance to attend Sunday School. Just come and enjoy! 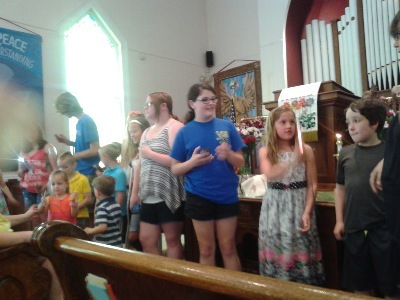 Here are participants in June's Children's/Youth Day! We have a lovely and very functional new Sunday School area. Join us! Below is our Confirmation Class and adult leaders, as they were working / volunteering at the Stanhope Clean-Up Day at the end of April. 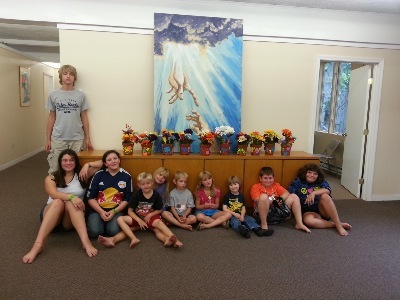 Here is our hearty group from VBS -- in August (apparently not the favorite time to go).